Corrosion Resistant Products Ltd. (CRP) of Littleborough, United Kingdom, recently started commercial production of large diameter pipe fittings (up to 14 inches) for the chemical processing industry that are lined in DuPont™ Teflon® PFA fluoropolymer resin. These new larger-sized fittings from CRP include a 90-degree elbow that is unique in terms of its use of PFA for the lining. CRP uses Teflon® PFA as it provides the highest resistance to permeation of all of the fluoropolymers and is the material of choice for the most aggressive conditions. Typical plants demanding large diameter fittings lined in PFA include vinyl chloride monomer plants producing PVC, chlor-alkali process plants and sites producing silicones, elastomers, solvents and chloro-methanes. Responding to market requirements, CRP has worked to increase the size range of pipe-fittings lined with Teflon® PFA from 6 inch (DN150) to 14 inch (DN350) – a four-fold increase in product scale. One of the most challenging parts in the new range from CRP is the 90 degree elbow, which is unique in its use of Teflon® PFA for the lining. In order to manufacture this, CRP has extended its range of investment cast steel castings, creating a one-piece (versus a more usual three-piece) design. This has the advantages of matching the ASME B16.5 dimensions favoured by industry and providing precise geometry for plant build. PFA also facilitates installation, not only with regard to its one-piece design, but also because PFA moulded flanges do not exhibit the classical memory effect, enabling fittings be taken out of line without worrying about flare faces lifting. Moreover, the superior creep performance of Teflon® PFA means that flanges require much less re-tightening to achieve a seal in process. 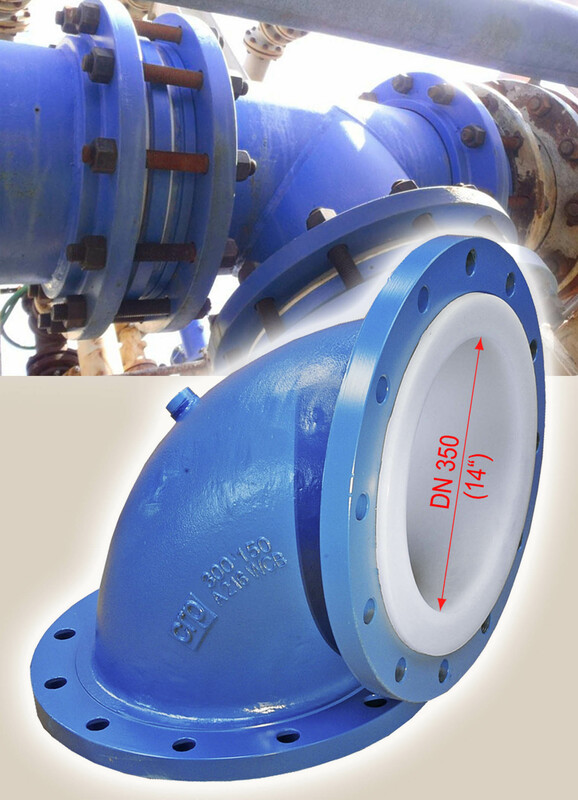 The fittings can withstand the full pressure requirement of ASME B16.5 group 1.1 materials of 14 bar at a maximum temperature of 200°C. For its customers conveying non-conducting materials such as solvents, CRP has already proven 14 inch sizes using Teflon® PFA C-980, the conductive “anti-static” grade of PFA from DuPont. The material’s excellent conductivity allows the discharge of electrostatic charges generated within pipelines.